Karangasem regency in Eastern Bali, is dominated by the towering cone of Mount Agung, the island´s tallest and most revered volcano. This regency was founded in the early 1700's. It was still recognized as a kingdom even after the Dutch conquest of Bali in the 1900´s. This regency still supports many traditions that have been in existence since the 14th century, having resisted the Javanese influence that invaded other regencies of Bali. This regency capital changed its name from Karangasem to Amlapura in 1963 after Mount Agung erupted in the hope that a similar eruption will never again take place. The palace is reflecting a number of foreign architectural influences in the late 9th century by the king Anak Agung Gede Jelantik. This palace still maintains the royal bedroom with Dutch furnishings, as well as various meeting and ceremonial halls. Royal photographs of the late King and family and various clothes are also on display. Architectural wonders at the Karangasem water temple in Taman Ujung. Beautiful Palace located on the third pond. With an outstanding view towards the Lombok Strait and over rice paddy fields, this water palace depicts a time of glory and glamour. Ujung Water Palace was built by the King of Karangasem, I Gusti Bagus Jelantik, who holds Anak Agung Agung Ketut Karangasem Anglurah. This palace is a privately owned by Karangasem Royal. It was built in 1909 on the initiative of Anak Agung Anglurah. The architect was a Dutch van Den Hentz and a Chinese Loto Ang. This development also involves the undagi (Balinese architect). Taman Ujung Karangasem inaugurated with a marble stele inscribed with the text in Latin and Balinese script and also two languages, Malay and Balinese. Moats, pools and water gardens were the passion of the late King of Karangasem. Sadly the palace was badly damaged in both the Mount Agung eruption of 1963 and a subsequent earthquake in 1979. 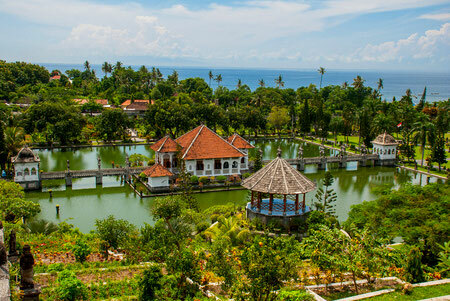 Built a few years later by the late King of Karangasem, this water-garden plays host to bathing pools fed by cool springs, ornamental water features and a swimming pool. Tourist resort named after an old temple on the nearby hillside. Beautiful beaches and good accommodation make Candidasa a good place from which you can discover the Eastern part of the island. In the village you will find a Gandhi meditation centre on the edge of lotus pond just beside the beach. Offshore islets and coral reefs make it an ideal diving and snorkling spot. A cargo ship torpedoed in 1942 consequently sunk near the coast of Tulamben and now offers divers an incredible array of marine life, still within shallow waters (between 2-10 meters) and in close proximity of the coastline. Padangbai is the largest Eastern port of Bali where ferries and ships travel to Lombok and beyond. Large luxury cruise liners anchor here close to the Silayukti sea temple. A Bali Aga village ( Bali Aga - descendants of the original Balinese who lived on this island before the influx of Javanese courtiers and artists of the Majapahit exodus from Java, between the 12th and 14th centuries). This immaculately kept village is located 5 kilometers North of Candidasa. They are famous for weaving the geringsing, a cloth that may take years to weave as the patterns of the textile are dyed to their final design whilst still in the thread stage. The conservative Bali Aga does not allow members of the village to marry outside of their community. Youngsters wishing to do so are banned from taking part in the intrinsic ceremonies. Their religious calendar is quite different to that of the rest of Bali. The villages of Tenganan and Dauh Tukad have many incredible ceremonies between June and July. Two villages which are renowned for village handicrafts such as stone carving, woven crafts and traditional costumes. 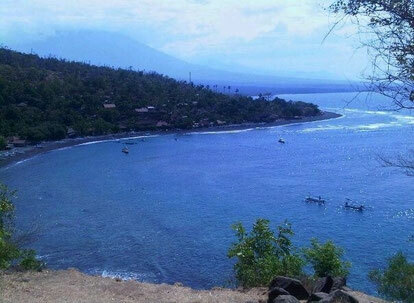 An attractive village located in the foothills of Mount Agung with cooler and more agreeable temperatures than the coast. A number of small hotels and villas cater to those looking for a more secluded place to stay than Candidasa. Balina Beach is a beach near Manggis with white sand and clear water, good for swimming and fishing. Sunsets from this vantage point are very romantic. This area is famous for the Salak or snake fruit plantations. Panoramic views of terraced rice paddy fields and the blue sea beyond afford good opportunities for avid photographers. Bebandem is a pretty market town with nearby Putung offering spectacular views on a clear day. Ceremonies and rituals held at this village encompass trance dances, battles using thorny pandan leaves and decorated with spectacular offerings. This village is famous for weaving brocades and the traditional Endek & Songket fabric. 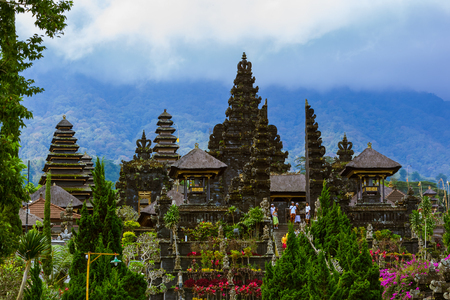 Bali´s largest and most revered temple since the 15th century is built about 1000 meters above sea level on the slopes of sacred Mount Agung. This temple complex is entered by climbing up one of two staircases passing several terraces. Each terrace contains about 30 different shrines or pagodas. Visitors are not allowed to enter the inner temple courtyards. Three main temples, Penataran Agung, Kiduling Kreteg and Batu Madeg were built to honor Siwa, Brahma and Wisnu respectively. Near the main gate is a pavilion called Pawedaan that is used by both Buddhist and Shiva priests when holding Weda recitations. Besakih enjoys many celebrations and Hindu ceremonies throughout the year and is visited by pilgrims from all over Bali. Climbing this mountain may take between 8 and 10 hours and is only recommended for the fit. Cloud cover may obscure the view from the summit. Trekkers should start at first light and will probably make it back by dusk. A large amount of bottled water, dried fruits and sweets are very necessary is as the descent in tiring due to partial exhaustion. Beyond the city of Amlapura, on the road which climbs past Tirtagangga, it is possible to traverse the coastline all the way to the northern coast. Passing through dusty little villages where mandarin orchards thrive in the hot weather, the road climbs over rocky volcanic outcrops, overlooking serene little beaches and shady stands of coconut palms. There are some excellent spots for scuba diving en route, Tulamben and Amed in particular, with its submerged wreck of the S.S.Liberty. Labukan Amuk is famous for its coral reef view. Most of the tourists do the snorkeling around the Labuhan Amuk area. In this village you also can find the new Odyssey Submarine that make it easy for you to see the underwater coral without the fear that your body will be scratched by coral. 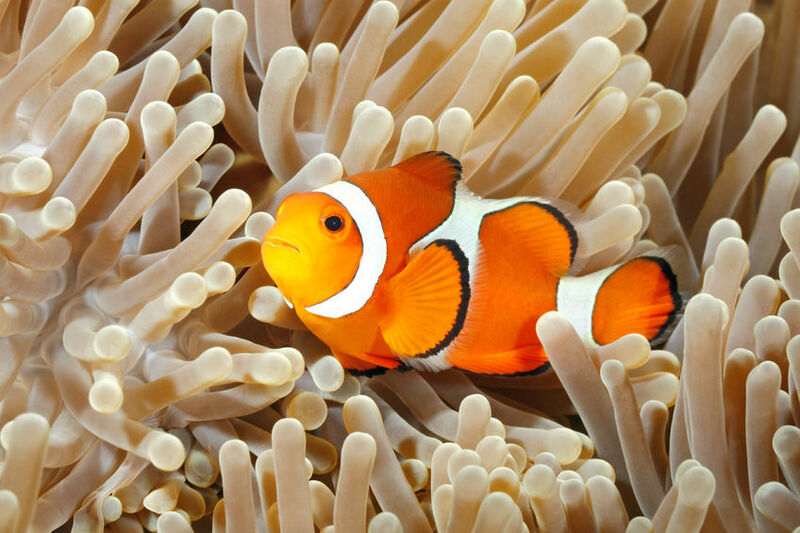 With this submarine, the visitors can see various coral and fish. The submarine can reach about 35 meters under sea level for about 45 minutes. About 20 years ago, Amed was just a quiet fishing village with only one losmen. It is still quite but it is also developed fast. There is a collection of nice beaches around this part of the coast, and they are all good for snorkling. Off the coast, there is a shipwreck, famous in diving circles. Boats can be hired to get there. This is a place to lounge on the shady beach with a good book.